Illustration by Kelly Miller. ThoughtCo. Hills and mountains are both natural land formations that rise out of the landscape. Unfortunately, there is no universally accepted standard definition for the height of a mountain or a hill. This can make it difficult to differentiate between the two. There are characteristics that we typically associate with mountains; for example, most mountains have steep slopes and a well-defined summit while hills tend to be rounded. This, however, is not always the case. Some mountain ranges, such as the Pocono Mountains in Pennsylvania, are geologically old and are therefore smaller and more rounded than more "classic" mountains such the Rocky Mountains in the western United States. 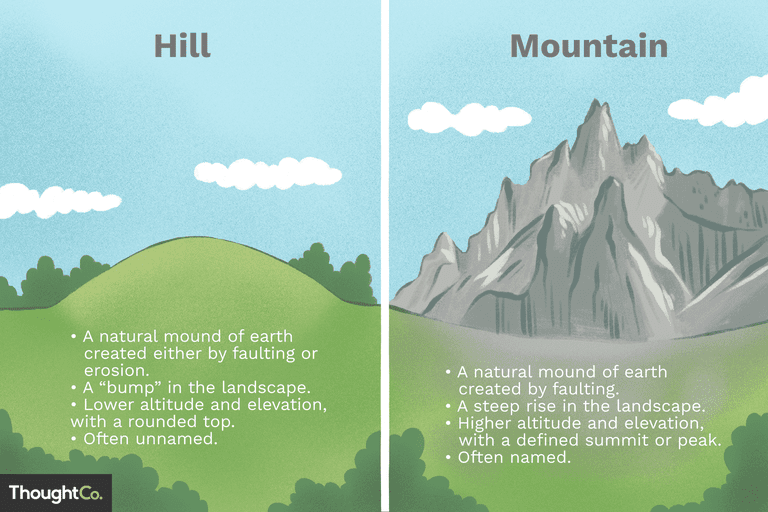 Even leaders in geography, like the United States Geological Survey (USGS), do not have an exact definition of a mountain and a hill. Instead, the organization's Geographic Names Information System (GNIS) uses broad categories for most land features, including mountains, hills, lakes, and rivers. Though no one can agree on the heights of mountains and hills, there are a few generally accepted characteristics that define each. According to the USGS, up until the 1920's the British Ordnance Survey defined a mountain as a geographic feature rising higher than 1000 feet (304 meters). The United States followed suit and defined a mountain as having a local relief higher than 1000 feet. This definition, however, was dropped in the late 1970's. There was even a movie about the battle over mountain and hill. In The Englishman That Went Up a Hill and Down a Mountain (1995, starring Hugh Grant), a Welsh village challenged cartographers' attempts to classify their 'mountain' as a hill by adding a pile of rocks to the top. A natural mound of earth created either by faulting or erosion. A 'bump' in the landscape, rising gradually from its surroundings. Low altitude and elevation, often less than 984-1968 feet (300-600 meters). A rounded top with no well-defined summit. Hills may have once been mountains that were worn down by erosion over many thousands of years. Contrariwise many mountains—such as the Himalayas in Asia—were created by tectonic faults and would have, at one time, been what we might now consider hills. Though a mountain is typically taller than a hill, there is no official height designation. 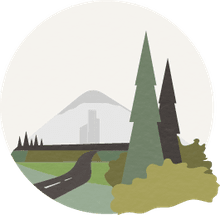 An abrupt difference in local topography is often described as a mountain, and such features will often have 'mount' or 'mountain' in their name; examples include Mount Hood, Mount Ranier, and Mount Washington. A natural mound of earth created by faulting. A very steep rise in the landscape that is often abrupt in comparison to its surroundings. High altitude and elevation, often higher than 1968 feet (600 meters). A steep slope and a defined summit or peak. Depending on the slopes and elevation, mountains can be a challenge to climb. Of course, there are exceptions to these assumptions and some features that would otherwise be called "mountains" have the word "hills" in their name. For instance, the Black Hills in South Dakota can also be thought of as a small, isolated mountain range. The highest peak is Harney Peak at 7242 feet of elevation and 2922 feet of prominence from the surrounding landscape. The Black Hills received their name from the Lakota Indians who called the mountains Paha Sapa, or "black hills."